Venus Goddess of Love Adult Costume.Includes: Full length burgundy to cream gown and headpiece. Available Size: Womens - Small/Medium (2-8), Womens - Medium/Large (10-14). (See Size Chart For More Information) *Shoes Not Included. Accessories Sold Separately. 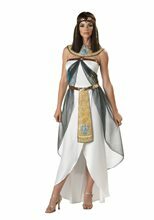 Become Venus ths Goddess of Love in this classic Venus Goddess of Love Adult Costume. Comes complete with a full length burgundy to cream gown and headpiece. Sandals sold separately. Not included.